This Display Cabinet Conveys Contemporary Elegance! This Display Cabinet is the Best Showcase! DisplayCabinets2Go.com Stocks It and Variations! Wheels allow for quick, easy relocation! Seven LED track lights, spaced over 2 side tracks, illuminate merchandise at every level! Showcase ships pre-assembled for easy set up! Locking door keeps showcase items safe! 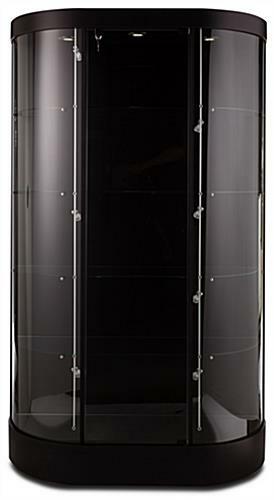 Click here for an instructional video on how to align hinged doors. 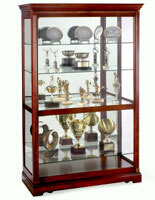 This display cabinet, likewise recognized as a curio cabinet, has many excellent characteristics. 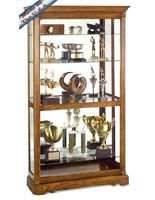 The display cabinet is illuminated to accentuate the elegance of display cabinet articles. Three 5-watt LED lights are recessed in the top canopy, while an supplemental seven spotlights are suspended upon a track inside the display cabinet, illuminating products at all level. 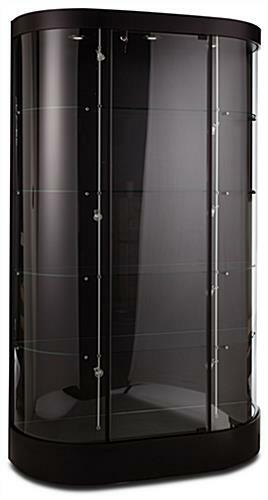 The display case incorporates a solid back with a curved, tempered glass front. 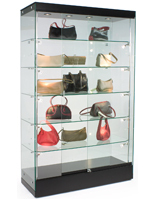 Four fixed height tempered glass display shelves supply five levels of display cabinet area. 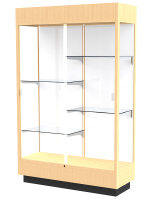 Wheels keep the display cabinet effortlessly movable, while a mirror deck further highlights display cabinet merchandise. 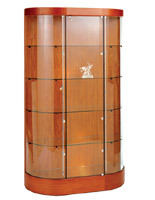 This display cabinet is a modern-styled curved display case. 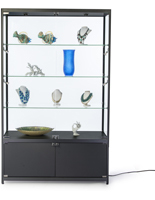 The display cabinet, showcase is an ideal option for gift shops, museums, galleries, jewelry stores, retail places and more. The glass display display cabinet can hold glass figurines, trinkets, collectibles, jewelry, and other highly priced articles. A retail store will discover this display cabinet extremely effectual for exhibiting articles, while keeping them secure. In requisition for a client to handle a exhibited good, he or she must ask a retail sales associate to open the display cabinet. 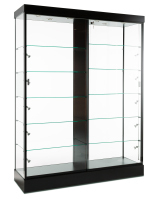 Buying a display cabinet can help preclude theft, saving your store money on lost profits. 45.0" x 74.5" x 15.5"